Huge migration crises are typically caused by war or natural disaster, as we have tragically seen in Syria, Afghanistan, Myanmar and South Sudan. But the largest migration crisis in Latin American history has been created by a failed state which denies its population basic access to food, water and healthcare, as part of a political and ideological strategy of social control to stay in power. This combination has created a humanitarian disaster, with the following results. How many Venezuelans have left their country to survive? Imagine being a senior citizen and having to migrate because you can't find the right medicine to treat your diabetes. Imagine being a father and deciding your family has to leave home because you can’t provide three meals a day. Imagine having to flee quickly from your country because you just got pregnant and you can’t receive prenatal care in local hospitals. The reality is that these decisions have been made by the 3.3 million Venezuelans who have left their country since 2015. The number continues to grow - 5,000 Venezuelans flee every single day. According to UNHCR, 68.5 million people are displaced around the world - 5% of them are Venezuelan. And if you take into consideration the data that the Center for International Development at Harvard University estimates through social media, the number of displaced Venezuelans increases to 5.5 million. This means that 10% of Venezuela’s population is becoming diaspora. But behind the numbers, there are people. People who are crossing into neighbouring countries such as Colombia, Panama, Peru, Ecuador, Brazil, Argentina and Chile in dire human conditions. Is Venezuela a pandemic threat to the region? As anticipated, Venezuela’s crisis has not been contained within its borders. It’s not only that 208 Venezuelans are leaving every hour, but also that they are arriving in countries hungry and sick. They are commonly suffering from severe malnutrition, diarrhoea, no vaccinations, and lack of prenatal care, and their arrival is spreading eradicated diseases to neighbouring countries. Colombia has received an important part of the blow. According to the Ministry of Health, 620 cases of malaria, 38 of malnutrition, 49 deaths to HIV and 26 maternal mortalities were reported in 2017. In 2018, those numbers increased to 1,191 cases of malaria, 256 of malnutrition, 253 deaths to HIV and 150 maternal mortalities. In the state of Roraima, Brazil in 2017, there were 2,576 malaria cases imported from Venezuela, representing 55% of all imported cases, according to PAHO. Between January and April 2018, the number of cases had already increased to 7,043. In Ecuador, between 29 March and 12 June 2018, 14 measles cases were confirmed, 75% of which were among Venezuelan citizens. The Ministry of Health of Trinidad and Tobago also confirmed 12 imported malaria cases in 2018, nine of them from Venezuela. Women fleeing Venezuela’s desperate infant mortality situation are crossing into countries to give birth. In the state of Roraima, Brazil, four out of 10 pregnancies are to Venezuelan mothers, causing the birth rate to jump from the annual average 8,000 before the crisis to 12,000 births in 2017. Colombia's situation is even more drastic. It registered more than 4,000 births to Venezuelan mothers during the past year. Most of these babies are stateless, since Colombian legislation only offers citizenship to children who have at least one Colombian parent. An “invisible generation” of Venezuelans is being born, who do not legally exist in either country. Venezuela has caused the region to undergo a health regression. Hospitals and clinics in receiving countries have already collapsed, creating a huge strain on state and local healthcare systems. The biggest obstacle is not having enough human capital, supplies or financial resources to keep operations going. The truth is that no country was prepared for this health holocaust. The question is: can the Venezuelan diaspora help out? What is the role of diasporas for countries in crisis? Addressing the magnitude of this challenge requires collaborative efforts from business, government and civil society. Experience has shown that including diasporas is crucial, especially as the Fourth Industrial Revolution changes how individuals relate to organizations and creates new phases of global cooperation. With this massive exodus, Venezuelans have been learning what it means to be diaspora, just as the Syrian, Jewish, Cuban, African, and Irish communities have had to. It’s a cultural, postmodern and organic term, which Venezuelans are trying to own in order to reach their maximum potential and build networks to send aid home or to the border. While adversity has strengthened the identity of Venezuelans abroad, solidarity has kept them active and alive. Helping people has become a routine and motivating way to stay connected to their homeland, whether it’s hosting a friend or relative for a few weeks, or revising someone’s resumé for a potential job offer. The Venezuelan diaspora is a great example of the “pay it forward” philosophy, assisting those who have migrated and asking only that they support someone else when the time comes. Diaspora workers already send money home – could they send knowledge? One interesting case is the Venezuelan diaspora in the US, which has already reached more than 600,000 people, mostly concentrated in Florida, Texas, New York and Massachusetts. 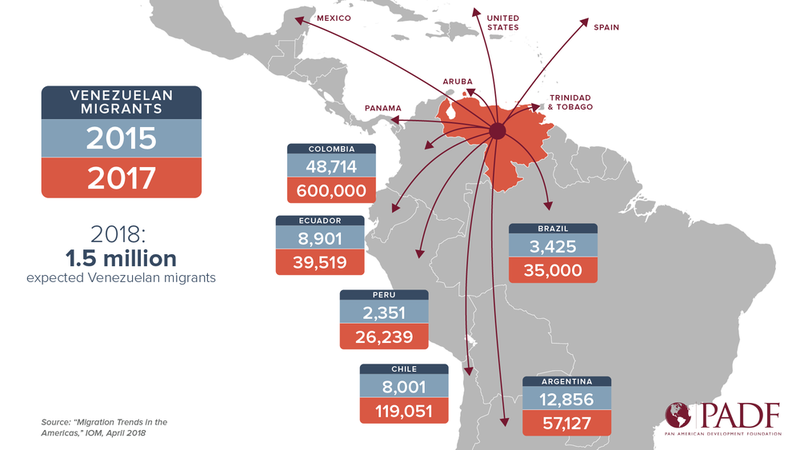 According to Vision Democrática Foundation (a coalition organization of Venezuelan diaspora), coordination has reached such a level that there are more than 100 NGOs within the US sending humanitarian aid to Venezuela, as well as to the receiving countries of the migration and refugee crisis. There are many positive cases of cooperation. For example, the USNS Comfort Hospital Ship partnered with the Venezuelan American Medical Association, which has more than 400 doctors, to send personnel on an 11-week medical support mission to Ecuador, Peru, and Colombia, during the last trimester of 2018. Staff provided care onboard and at medical sites on land, helping to relieve pressure on national medical systems. Most recently, international emergency response organization MedGlobal partnered with the School of Medicine of the University of Miami to send medical aid missions to Colombia with Venezuelan doctors and nurses during 2019. With 27% of Venezuelan migrants being children, and many more being women of childbearing age, there is a dire need for primary care, paediatric care and obstetric care in Colombia. Venezuelans with a medical licence in any part of the world can volunteer to participate in these missions, to contribute towards alleviating the impact of the healthcare crisis in cities such as Cúcuta, Valledupar and Cartagena. Even Global Shapers who have emigrated from Venezuela have connected to local Hubs in their new cities, inviting them to participate in building initiatives to support Venezuelan refugees, whether through health or nutrition assistance, legal aid, capacity building or education. For example, Global Shapers from Medellín, Colombia joined forces with a local NGO called “Fundación Solidaridad Sin Límites” in September 2018. They carried out a “Health Day”, collecting personal hygiene kits, vitamins, paediatric and adult pain relief, deworming medication and other medical supplies to bring aid to hundreds of Venezuelan refugees in their area. Continuing collaborative efforts between Global Shapers and the Venezuelan diaspora will help reunite, channel and amplify solidarity towards this vulnerable population, wherever it may be. Tapping into diasporas convening power is a key part of success. They are the best people to engage with their own communities and share valuable insight around how to prioritize aid when their countries are in conflict. Venezuela diaspora has lost no time in getting involved. Members have become spokespeople for humanitarian initiatives; educated communities; practiced advocacy; influenced policy-makers; developed infrastructure; and found the necessary means to guarantee that projects are inclusive and sustainable. For now, participating in and spreading the word about NGO efforts is a significant way in which some diaspora can help those back home. Others choose to support people when they arrive in new cities, offering shelter, food, clothes and know-how, “paying it forward” by helping newer migrants find their feet. In the end, all Venezuelans are investing in these efforts for the same reason. They are hoping things will change, and that they might be the first to return home.